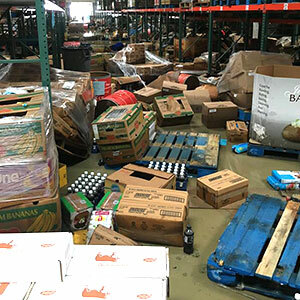 In response to the floods that devastated Southern & South-West Louisiana in August, Feeding America is in need of material handling equipment donations to replace what was lost at the Greater Baton Rouge Food Bank. This critical partner in feeding hungry people throughout the Greater Baton Rouge area usually operates from a 172,000 square foot warehouse with a 6,000 square foot freezer. The facility suffered significant damage in the floods. They took in over four feet of water, and their fleet and equipment was a total loss. It is estimated to cost between $7,500,000-$8,500,000 to make the facility fully operational once again. They are currently distributing food from a 18,000 square foot temporary facility with loaned trucks and equipment. Feeding America is looking for new or refurbished material handling and logistics equipment to help this food bank get back to the important work they do supporting the people of the Greater Baton Rouge area in their times of need. If you think you or your firm can help or if you know of any other donated equipment or services that could be helpful, please complete this short survey. How does Feeding America’s supply chain work? Feeding America’s mission is to feed America’s hungry through a nationwide network of member food banks and engage our country in the fight to end hunger. Together they are the nation’s leading domestic hunger-relief organization with a network of 200 food banks, 60,000 food pantries and meal programs. How does this supply chain work? Feeding America then delivers the donated food and groceries to food banks. The food banks distribute food and groceries through food pantries and meal programs that serve hungry families, children and senior citizens. Last year Feeding America distributed more than 4 billion meals to people in need. None of this could be possible with out the material handling equipment that makes their supply chain work. Feeding America, the American Logistics Aide Network and MHI have enjoyed a long-standing collaborative relationship. Please consider helping by making material handling equipment donations if you are able. If you have specific questions about assistance, please contact Mark Biewald, Director Compliance and Capability at mbiewald@feedingamerica.org or 312-641-6843.